Martin Luther (1483-1546) - Martin Luther is considered one of the most significant figures in history for he single-handedly initiated one of the most significant movements in history - The Protestant Reformation. His story begins in 1505 when he was studying to become a lawyer at the University of Erfurt in Germany. While returning to school after a visit home, he got caught in a thunderstorm and was nearly struck by lightning. In terror, he cried aloud, "Help me, St. Anne! I will become a monk!" He survived the storm and fulfilled his promise. Within weeks, he dropped out of law school, sold most of his belongings and joined an Augustinian monastery. His father was said to have been furious for what he saw as throwing away a valuable education. But Luther didn't budge. He threw himself completely into his religious studies. In 1507, he became an ordained priest. In 1508, he earned a bachelor's degree in Biblical scholarship and became a teacher of theology. In 1512 he completed his doctorate and joined the faculty at the University of Wittenberg. By all accounts, Luther was a fervent penitent. He would spend hours at a time fasting, praying and trying to relieve his conscience of his sins. He supposedly confessed them to his superiors over and over again to the point where they grew tired of hearing his confessions. It seemed that no matter what he did, he was unable to assuage his guilt. His view of God was that of a righteous judge who was impossible to please through good works. Then in about 1515, while lecturing at Wittenberg on the Book of Romans, he seemed to have a "Eureka" moment. For some reason, Romans 1:17, a verse with which he was quite familiar, jumped out at him in a way that it never had before. It reads: "For therein is the righteousness of God revealed from faith to faith: as it is written, 'The just shall live by faith.'" (Rom 1:17). And that's when it dawned on him that no amount of fasting or confessing could save him, but it was one's faith in Christ that did. He wrote later, "This passage of Paul became to me a gate to heaven." Martin Luther could very easily have kept the revelation to himself and lived out the rest of his life quietly, but he chose not to. As an ordained priest, he had come to view the Catholic Church as corrupt. Its leaders became rich by selling indulgences for the forgiveness of sins. So he let them know about it when he famously posted a letter containing 95 theses on the door of All Saints' Church at the University of Wittenberg on October 31, 1517. It was addressed to the Archbishop of Mainz. Although written in Latin, the letter was translated into German and published (thank you Guttenberg's printing press). Luther never intended to break with the church, but his actions challenged the established hierarchy and quickly became popular with the general public. The growing controversy forced Archbishop Albrecht to forward the letter onto the Pope in Rome. Pope Leo X ordered Luther to recant his grievances against the church or face excommunication. 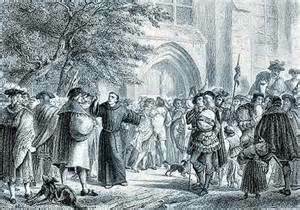 Luther refused and was excommunicated on January 3, 1521. Under normal circumstances, this action usually forced the excommunicated to make amends with the Pope (see Holy Roman Emperor Henry IV); but in this case, Luther had created such a groundswell of support that he was able to survive the full force of the church against him. The Reformation was underway.